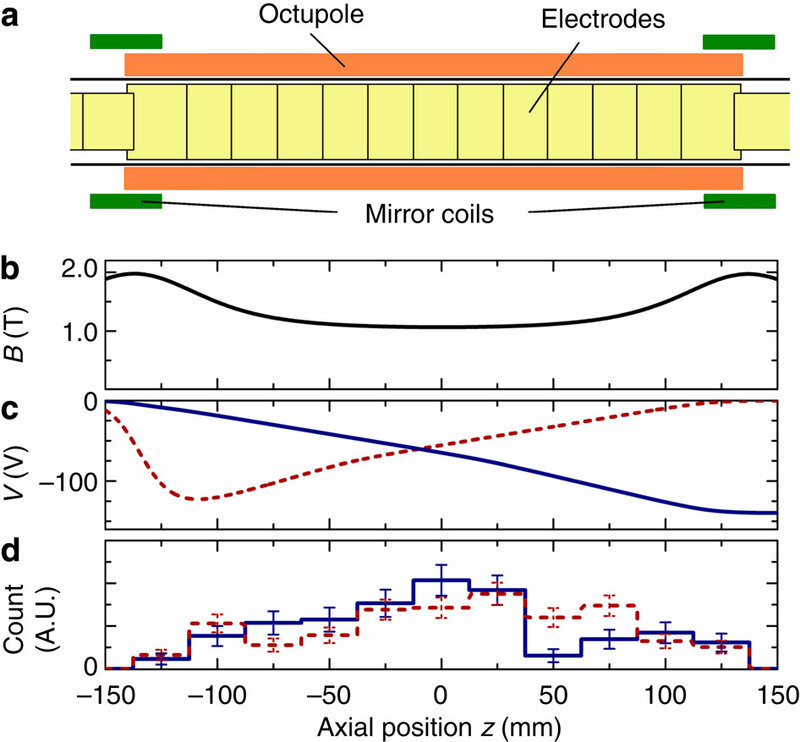 (a) A schematic of the antihydrogen production and trapping region of the ALPHA apparatus, showing the cryogenically cooled cylindrical Penning–Malmberg trap electrodes, and the mirror and octupole magnet coils. Our positron source (not shown) is towards the right, and the antiproton decelerator (not shown) is towards the left. (b) The on-axis magnetic field B as a function of z. (c) The on-axis electrostatic potentials V used to establish the Bias-Right (red dashed line) and Bias-Left (blue solid line) configurations. (d) Normalized histograms of the experimental z positions of the annihilations in the Bias-Right (red dashed line) and Bias-Left (blue solid line) configurations. The error bars show the expected deviation of the distribution based on the number of observed antiatoms in each bin. 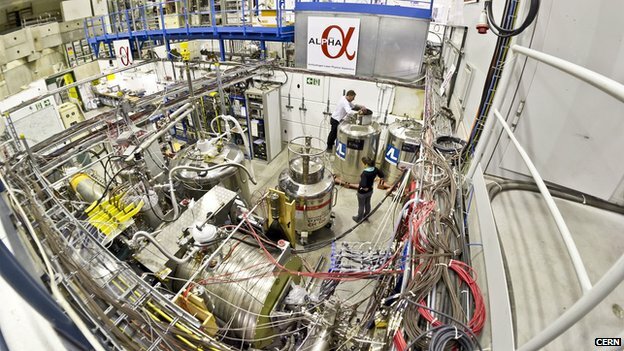 In a paper published in the journal Nature Communications today, the ALPHA experiment at CERN’s Antiproton Decelerator (AD) reports a measurement of the electric charge of antihydrogen atoms, finding it to be compatible with zero to eight decimal places. Although this result comes as no surprise, since hydrogen atoms are electrically neutral, it is the first time that the charge of an antiatom has been measured to high precision. For every fundamental particle, there is a corresponding antiparticle. Antimatter particles share the same mass as their matter counterparts, but qualities such as electric charge are opposite. Though most particles exist as either matter or antimatter, some particles can switch between the two. B0 and B0s are such particles. They oscillate between their matter and antimatter equivalents up to 3 million million times per second. If that frequency were converted directly into the pitch of a musical note, it would be much too high for the human ear to hear. So the LHCb collaboration has slowed down the frequency millions of times so that we can enjoy the oscillation as detectable sound. So sit back, relax, and enjoy the music of particles switching to antimatter and back millions of times per second. Physicists have long wondered whether the gravitational interactions between matter and antimatter might be different from those between matter and itself. Although there are many indirect indications that no such differences exist and that the weak equivalence principle holds, there have been no direct, free-fall style, experimental tests of gravity on antimatter. Here we describe a novel direct test methodology; we search for a propensity for antihydrogen atoms to fall downward when released from the ALPHA antihydrogen trap. In the absence of systematic errors, we can reject ratios of the gravitational to inertial mass of antihydrogen >75 at a statistical significance level of 5%; worst-case systematic errors increase the minimum rejection ratio to 110. A similar search places somewhat tighter bounds on a negative gravitational mass, that is, on antigravity. This methodology, coupled with ongoing experimental improvements, should allow us to bound the ratio within the more interesting near equivalence regime…. AEgIS is a physics experiment that takes place at the european laboratory CERN, using the antiprotons delivered by the AD accelerator. AEgIS is a collaboration of physicists from all around the world. 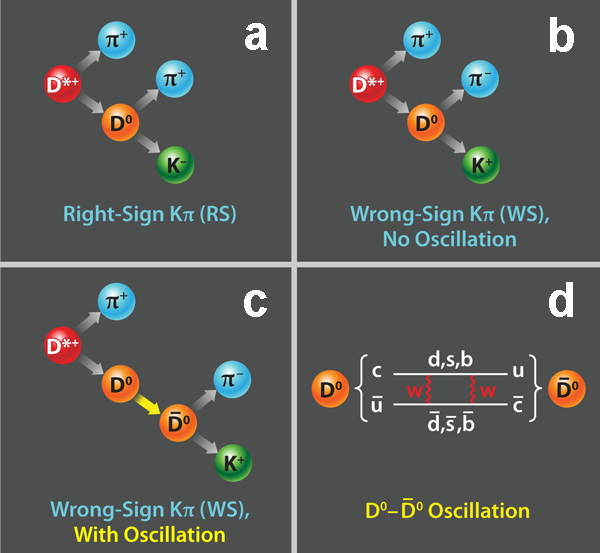 The ALPHA collaboration (of which I am a member) has made great strides recently in trapping antihydrogen[1, 2] and starting down the path of making spectroscopic measurements. The primary goal of the experiment is to test CPT invariance but there is also interest in testing another fundamental issue – the gravitational interaction between matter and antimatter (the so-called question of “antigravity”). I argue in this short paper that bending of light by the sun provides a more stringent limit than this2….